Pride Guide Peter Charney is a junior majoring in Theater Arts with a concentration in directing. 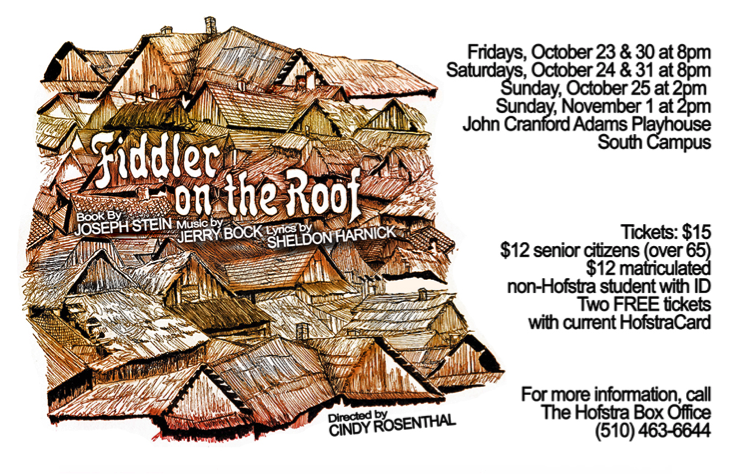 This year, the Hofstra University Department of Drama and Dance is bringing Fiddler on the Roof to the John Cranford Adams Playhouse, one of the six theaters on campus. Peter is part of the cast and tells us how Hofstra is producing the classic musical with its own history of tradition. Celebrating Tradition! After over 50 years of worldwide success, Fiddler on the Roof is one of the most beloved musicals of all-time. Based on Sholom Aleichim’s iconic tales of Tevye and his daughters, Fiddler on the Roof is set in the Jewish shtetls of the early 20th century Russia. However, the ideas of the musical are universal and explores family, faith, and, most importantly, tradition! As a student, working on this production of Fiddler has been an incredible experience in many ways. Producing high-quality performances is the standard at Hofstra, but what makes our show so special is the team working behind-the-scenes. Our director, Cindy Rosenthal, once appeared in an East Coast tour of Fiddler. Stas Kmiec, our choreographer, and Andrew Abrams, our musical director, have also worked on countless productions of Fiddler. All three have worked with Theodore Bikel, the late actor who appeared as Tevye approximately 2,000 times more than any other actor. Our production is dedicated in his memory. The cool thing about having so much Fiddler history in our rehearsal room is that we are only one degree of separation away from the original 1964 Broadway production. We are hearing stories about why specific songs belong to certain characters and why this character does this particular dance move differently from everyone else. It’s like there are these big secrets that we’re being let in on. Stas, our choreographer, refers to certain dance moves as “flippydoo,” “fishbone,” and “sausage” just as the moves are referred to in all major productions of Fiddler. Imagine learning this unusual, barely spoken language that only exists amongst a handful of people at any given time. As actors, this presents us with an incredible opportunity to recreate the original choreography and bring new life into it. I believe that process is truly extraordinary in many ways, and it continues to bring our cast together with such likeness to the community that Fiddler on the Roof represents. Even though this is our distinct interpretation of Fiddler on the Roof, we can always think back over 50 years ago and trust the traditions as they were defined then, and smile knowing that we have made these traditions our own. 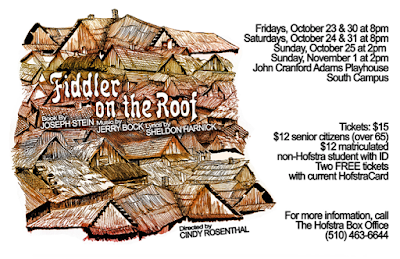 I hope you will come see our production of Fiddler on the Roof!